Dear all – we hope you can spare several minutes to read this heartfelt plea for assistance, and we hope for your kind donation to help out a troubled family in dire straits. Condition: Cerebral blood vessel rupture – there is a blood clot oppressing his nerve line. Family members: Two sons and one daughter aged between 2-6 years old. Boon Boo Fan, 29 years old this year, is a Malaysian working in Singapore. He was found unconscious due to dyspnea on 24th March 2018. He was admitted to Khoo Teck Puat Hospital and after examination, his blood vessel was found ruptured with blood clots oppressing his brain nerves. Therefore, he has been admitted to ICU (Intensive Care Unit) for treatment and has yet to regain consciousness till now. Boo Fan’s medical bill is the biggest concern for his family members. 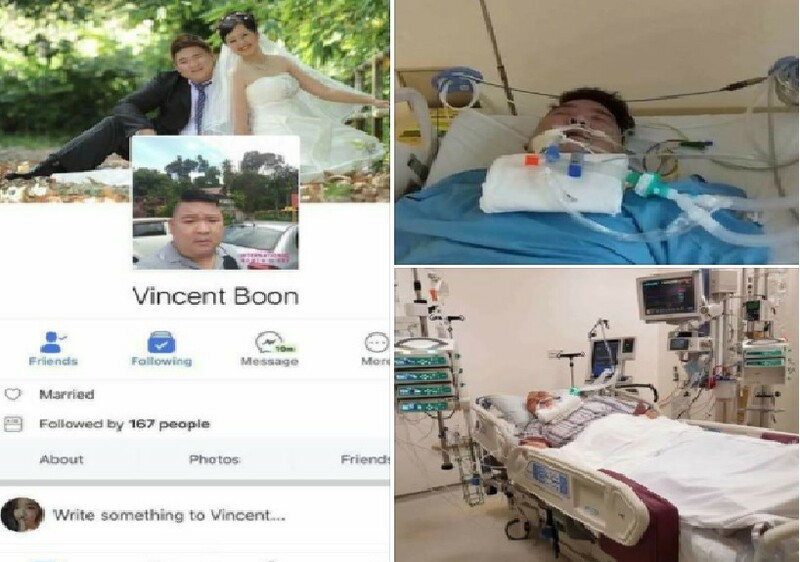 His family members want to transfer him back to Malaysia, Johor Bahru hospital but his condition is too critical to do so – transferring him could be fatal at this critical juncture. In the absence of a solution, his family has no choice but to turn to the public for help. We hope that all kind-hearted people can lend a helping hand to help Boo Fan to overcome this crisis. Your help will give him a chance to receive the treatment he dearly needs in Singapore. We would like to call upon the kindness in all readers’ hearts to donate funds to help Boo Fan’s family – any amount you can spare will be dearly welcomed, no matter how large or small, and will contribute greatly to aiding Boo Fan and his young family. Thank you so much for taking the time to read this message, you have our heartfelt gratitude regardless of your decision to donate or not. We would deeply appreciate it if you could also take a few moments to share this message – for those kind-hearted souls who are interested in donation, please donate to following accounts.